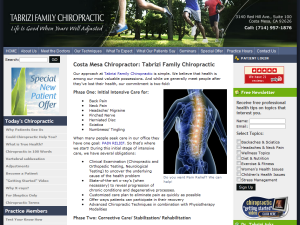 Tabrizi Family Chiropractic offers Costa Mesa, Irvine, Santa Ana and Newport Beach community with advanced chiropractic techniques in combination with physiotherapy modalities. 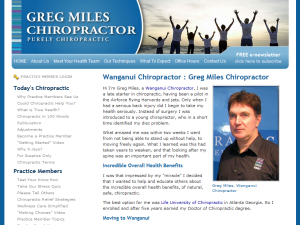 Life University of Chiropractic graduate offers Wanganui, Marton and Gonville families with Gonstead, Activator Methods® and SOT adjusting methods. 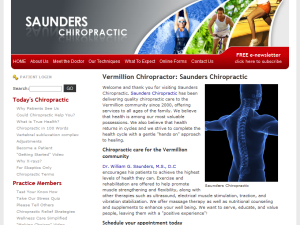 Northwestern College of Chiropractic graduate provides chiropractic care in the Vermillion community in South Dakota since 2000. 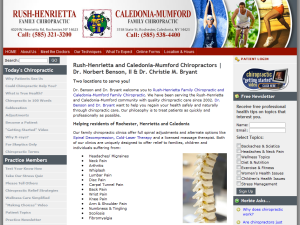 Dr. Norbert W. Benson, II and Dr. Christie M. Bryant of Rush-Henrietta Family Chiropractic offer Gonstead, Diversified, Thompson, Activator Methods®, Pro-Adjuster and Palmer Package adjusting methods. 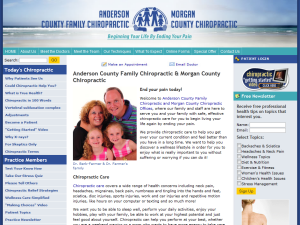 Cold Laser Therapy and Spinal Decompression are also available. Offering Thompson, Diversified, Gonstead, Activator Methods®, Cox Flexion-Distraction and Palmer Package adjusting techniques from two convenient locations in Anderson County and Morgan County. Physiotherapy is also available.